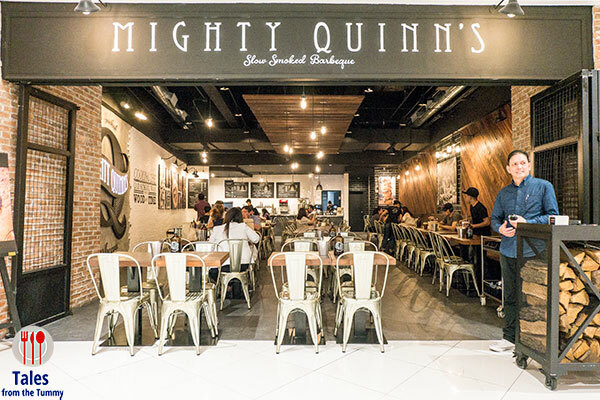 Mighty Quinn’s is a barbecue joint franchise from New York brought in by the Standard Hospitality Group (Yabu, Ippudo). The first branch in the Philippines is located at the 3/F of the SM Megamall Fashion Hall. The other international locations are in Dubai, Taiwan and Japan. 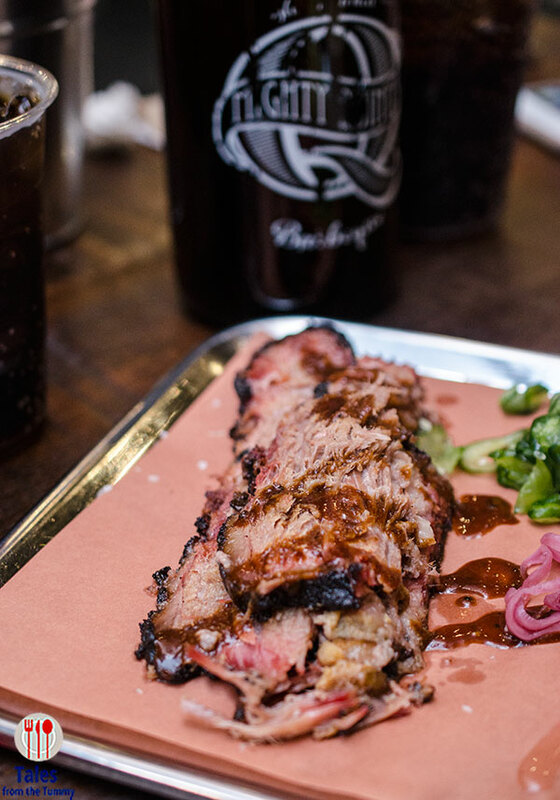 BBQ, the slow, smoking kind has seen a boom with a number of homegrown restaurants like The Smoking Joint, Smokeyard and Holy Smokes opening up recently. Natural color tones and heavy wooden and steel furniture dominate the place, successfully bringing the rustic, outdoor feel, into the mall. The resident manager is Mon, who I’ve met from Yabu’s first store in Megamall, to Ippudo then finally in Mighty Quinn’s. 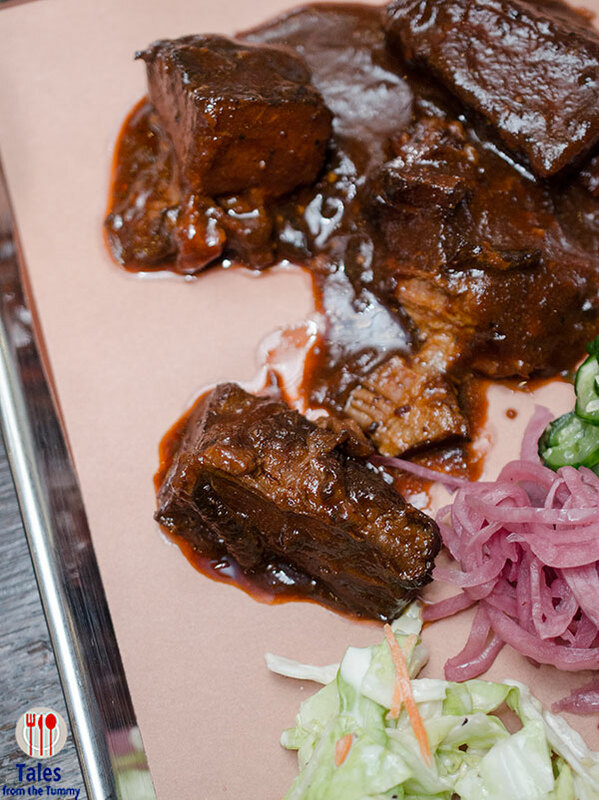 He’s so memorably good that some people have gone in and eaten at Mighty Quinn’s just because he is there. 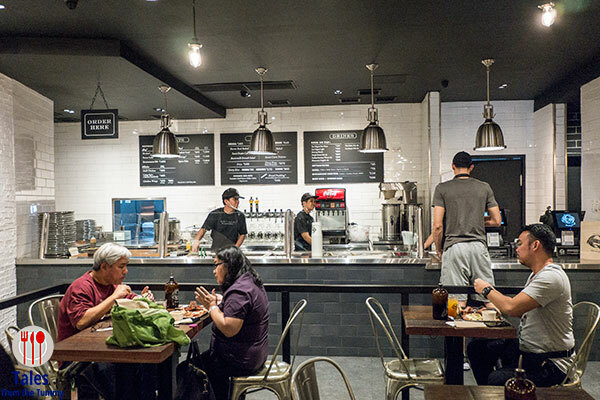 Ordering is self service with a simple menu board composed of select bbq items (pork, chicken and, beef). You can see the staff assemble your selection on a aluminum tray. 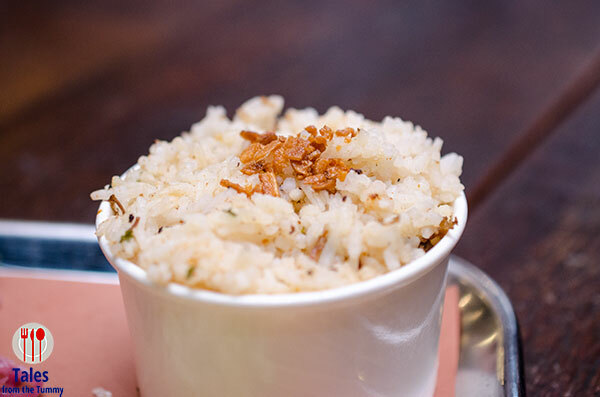 Meats are available as single serve, with dirty rice or buns, and by the pound. Side options include baked beans, sweet potato casserole, buttermilk broccoli salad, potato salad, sweet corn fritters and slaw. There was 3 of us during my lunch visit to Mighty Quinn’s so we decided to order 3 items from the menu. First was the Brisket (P495/ single, P1,295/pound). Aside from the carb option, each single serve order also comes with 2 pickles and slaw. The meat was tender, flavor packed and smoky but I felt it was a tad dry for me. Extra bbq sauce is provided on each table so you can just add to your preference. We got the brisket with dirty rice and it was really good and serving size was generous. This goes real well with the meats. Burnt Ends (P495/ single, P1,295/pound). These are part of the brisket but have higher fat are cooked longer so you get more charring. I loved these cubes of meat smothered in house bbq sauce. It’s the first time I’ve had them and the flavor is more intense. Pulled Pork (P485/ single, P1,290/pound). This one was for Irene and she loved it. Roughly pulled so it’s not as flaked out as I expected. 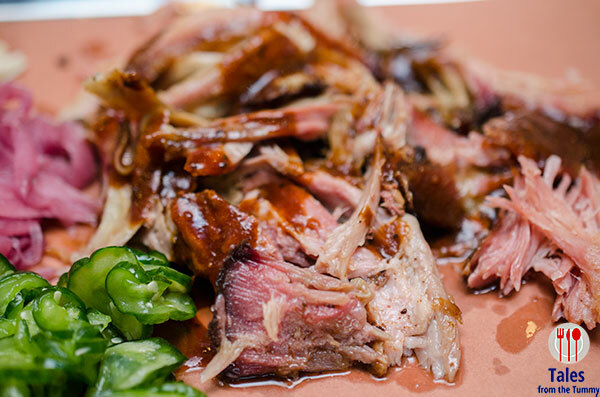 The smoky flavor is really evident and with just a few dabs of bbq sauce, this one really shines. This is a good option for non beef eater who still want to have their bbq. 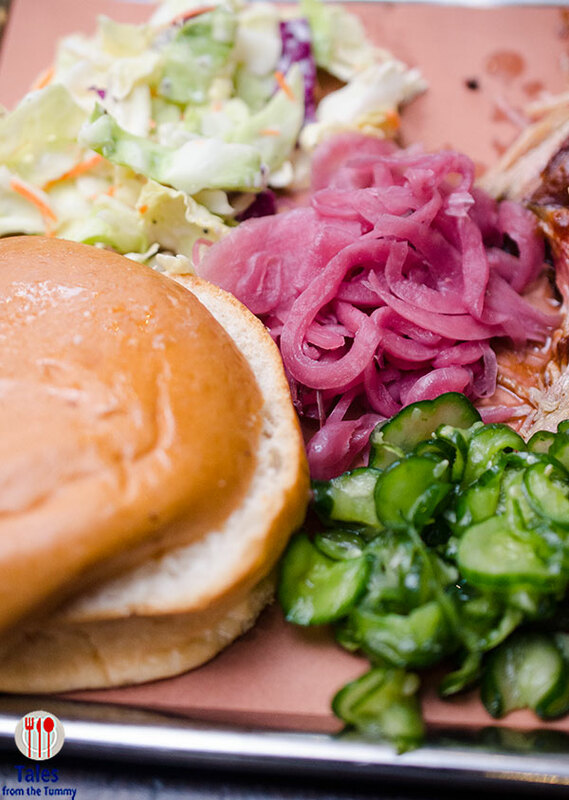 We got buns to go with the pulled pork and you can use this to assemble your own bbq sandwich. For the included sides, I liked the coleslaw and the cucumber pickles but will skip the onions next visit. Mighty Quinn’s is a great mall option if the bbq craving hits, portions are good sized, meats are well smoked and flavorful. I’ve yet to try their giant Brontosaurus Rib (P1,450), an order that is good for 3 people.